The ACC Platform represents a flexible network of urban scholars with multiple perspectives and projects, and is used as a resource university-wide by academics to meet, share research, base projects, and contribute to teaching. The African Centre for Cities at the University of Cape Town is a university-wide resource and network where scholars with multiple perspectives and projects are encouraged to meet, mix, share their research, base their urban research projects, and contribute to vital teaching. Some of the major research projects involve diverse academics from UCT . Presently ACC is working closely with 4 postdoc and 9 PhD students. The ACC Platform represents a flexible network of urban scholars who identify with the objectives of the ACC and see an opportunity to enrich their own scholarship through engagement with ACC initiatives. The ACC Platform is convened once a year to update the network on the ACC’s work, learning and future plans to enhance the embedding of the Centre at the university. 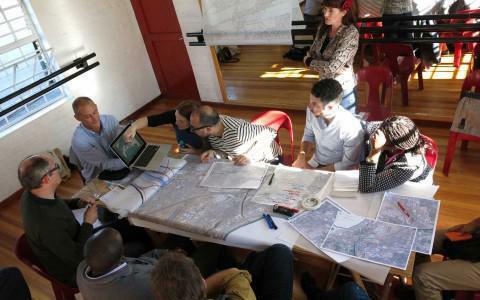 A good example of an ACC platform at UCT was the two-day workshop exploring ideas of radical incrementalism in urban areas held in October 2014. Open to anyone at UCT, it was attended by some 20 people, including invited guests from abroad. The purpose was to discuss theories and practices that can support emancipatory change across urban regions through the power of urban dwellers to challenge poverty, oppression and unjust environments. These actions and processes take place within and beyond the state and suggest important ways to evaluate prospects for socio-ecological equality across infrastructures, everyday life and the wider urban condition. Another example of collaborative urban scholarship across UCT involves a team of senior academics and students who are currently working together on a year-long research project to assess the ways in which land is valued in Africa cities, and ways in which this could be improved to facilitate infrastructure funding and development. The work is being led by two of ACC’s Adjunct Professors, Stephen Berrisford and Ian Palmer, and is funded by the Department for International Development DfID (UK). A previous initiative by Stephen Berrisford yielded a Special Issue of a peer-reviewed journal on African Urban Planning Law.